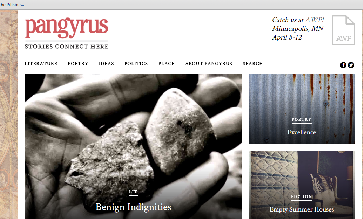 Several weeks ago I had a conversation with Greg Harris, the editor of the new Boston-based literary journal Pangyrus. His ambition for the journal is to connect writers and editors, and alleviate the isolation of the submission process, on both sides of the transom, through a community-focused site. The online journal was launched in October 2014 and the first print edition, Spring 2015, was published in time for the AWP conference. This interview is edited and condensed from our conversation. First, what does Pangyrus mean? It’s a made-up, compound word: Pangaea, which was the world’s supercontinent before the continents divided, and then gyrus, which are the whorls or ridges of the brain. Also, the temporal gyri are where a lot of verbal associations happens. So the name points to the way that the journal is going to try to be a place where geographic communities and different creative communities intersect and are connected. With Pangyrus you’re trying to create something beyond the journal, you’re trying to create a community and an interchange between editors and contributors in the editorial process. Can you talk about that? The idea is for the journal to be the center of a community that is trying to combat the isolation and low-information environment that writers struggle in, and I think editors do as well. When beginning writers are trying to break into print and are getting rejected, the standard advice is to just send out more and more stuff, to toughen your skin. But each one of those moments of contact with a journal is very, very low information. Often it’s a form rejection or, even if you’re thrilled with a little signature at the end, you wonder what it means. We’re used to receiving that kind of information in a class. Yet, you may take lots of classes and even graduate with an MFA, and still not necessarily be all that close to being published. To bridge that information gap felt important to me. From an editor’s standpoint, you can feel overwhelmed by the number of things that come in that have to get rejected. And somebody like Christina Thompson, the editor of the Harvard Review, who’s a friend, she says it’s just soul-killing to have to reject 99% of everything that comes over. Editors spend a lot of time with texts, also maybe feeling a little isolated. And so we’re trying to design a journal where editors have the option of forming a more cooperative, collaborative, communicative relationship with authors. One of the reasons they don’t is because it’s incredibly time consuming to try to bring writers along. And editors are among the casualties of the Internet era where creative work isn’t compensated well. Yet what editors offer is incredibly valuable. It will be better for everyone if editors could spend time, and be in a better position to support themselves. Right now you have a standard submission process but you’ve said you have ambitious plans you hope to implement this year. We’ll continue to have regular submissions, but in the near future writers will also be able to choose an enhanced submission, where they can receive feedback from an editor or editors about their work and, if rejected, see what the deciding points were: an information-rich rejection. We’d like to have a panel of editors who writers can contract with, for developmental work, and get really thorough critiques. Writers can learn from someone who is thinking about the publishability of their work. Not just that endless loop of perfecting craft. Writers will pay some small amount of money, I don’t know how much that will be, to compensate the editor for his or her time. We’re currently prototyping the technological piece, trying Google Docs, and trying to make sure it’s secure, easy to use, and integrates with our web site. I’m not sure if that will work. It might initially look more like an electronic note or margin comments. This is an experiment. We also want to see what demand there is. And we need to make sure the messaging is clear: that none of the editorial information that we give, or relationships that form will actually influence being published in Pangyrus. You’re not more likely to get in if you pay. So we have to be really careful and take baby steps. This is meant to be a support for writers, and a support for the editors, and a revenue stream for the journal. And we’re trying to design a site registration/submission /subscription process that’s all-in-one, where you sign up to become a member and you choose what to do with that. We’re trying to design a journal where editors have the option of forming a more cooperative, collaborative, communicative relationship with authors. What about the skeptics who wonder: who are the editors? How can you guarantee that this is going to be a positive process? The enhanced submissions have to be optional, right? Early on I was really honored when people sent submissions for a journal that hadn’t even come out yet. So I made the mistake a couple of times to send a few writers revision suggestions, and I didn’t hear anything back from those writers And Anne Bernays, who’s our fiction editor, she said, “Greg, it stings when you get rejected.” Some people might be ready for advice, and for some people it’s like rubbing salt in a wound. You don’t know how the writer feels. And so that’s why the enhanced submissions have to be something that a writer wants, to work with an editor to help develop an idea, or refine a manuscript that’s been rejected 15 other places. The editors those writers will work with won’t necessarily be ones on the journal’s masthead. They’ll be editors that we vet very carefully from other places like Grub Street, which have a very strong community orientation to begin with. Editors who have teaching backgrounds as opposed to the summary-rejection kind of backgrounds. It’s surprising how different the mindsets are—not spending time with a piece if the first page doesn’t grab you, compared to sticking with it, just hoping maybe it actually starts on page five. As a teacher, I've seen lots of pieces that I’ve successfully helped a writer rescue, through multiple drafts. But for an editor on a deadline, with a magazine to publish, it isn't necessarily wise to spend that time. You’re a writer, an editor, a writing teacher at Harvard’s John F. Kennedy School of Government, a story teller. Which of these roles or what part of you brought you to this idea? The drive is—I grew up a Navy brat, so I moved around constantly. And I’ve always struggled to feel connected to community. Even in writing novels that I don’t think are even vaguely about that, I find myself, after I write it, thinking, oh yeah, that’s what it was about, again. Connecting to community. So I think that’s where that drive to create a different model comes from, to build something different from the mass-broadcast model, in which a small group in isolation desperately tries to get heard by a large number of people. Let’s just bring everybody in, and connect them, and see if that model works. Will you continue to publish both online and in print? There’s an appeal to having a print journal, but online you’re publishing beyond print and images, to include all kinds of media-based art. You recently posted your first video piece. Yes, Kim Stafford, who runs the Northwest Writing Institute, has a poem, “Benign Indignities,” recited on film and paired with a song. And there’s an interactive poem by Collier Nogues. When you move a mouse over it, the words appear and disappear. We’re doing multimedia, more and more. What I’m really hoping to publish are pieces about video games as narrative. Not to make games, but to make stories within the media of games. Eric Lemay has come out with a few playable essays, like one on another site which is about Tetris and you play it while you’re reading. We’ve just posted a new piece of his, that’s spoken poetry with a video background. I would love to be exploring this new genre using the site. I want to hear from people working in different media. You know, these are my roots as a storyteller. I have a very, very broad sense of what narrative and literature can comprise. The historical moment we’re in has a lot of pitfalls, say, for people who want to get paid, but it’s also a moment when we have ways of experimenting with storytelling that just didn’t exist before, and means of distribution that’s are just astounding. With the print edition we hope to be able to offer subscribers a lot of latitude as to format, so that there will be actual print editions, and also editions in different electronic formats, such as pdf or Kindle. Far in the future, we might be able to automate a process whereby people can construct editions from our archives out of different sub-genres, and have their favorite pieces delivered as books for their coffee table or delivered to their iPad, for themselves or as a gift. What are your long-term dreams for the journal and the community you want to build? For one thing, events. We’re going to pull together two or three events in the spring and summer. I think the first one might be at the Harvard Lit Fest. We’ll do an event with editors from small presses or journals, and maybe another event around food writing, combining a talk and some food. The events are obviously local to Boston, but I’d love to have events online, say, in terms of craft discussion, where people can drop in and chat. And I’d love to start weaving in some of the different, actual geographic areas. We’re exploring having a Northwest connection. It would be great to put communities in communication with each other and create craft articles, reviews and projects for the journal. So writers, artists, editors, etc. can become members of the community of Pangyrus? The general proposition is really something like community-supported literature. We’ll try to keep thinking of ways to weave people in and therefore have value to the community and be worth supporting, and be trusted as a good-faith actor in editing and publishing, in respect to bookstores, and in respect with social-mission institutions. Because, once we offer these editing services, one thought we’ve had—this came from teaching at the Kennedy School, and seeing how you can bring writing skills to people who don’t necessarily think of themselves as writers—is that we can direct some of these resources to help communities which don’t typically have representation in literature, to gain the skills to have a voice and represent their experience. To have a civic mission and not just a literary one. Greg Harris was born in Boston and received his MFA in Creative Writing from Oregon State University. He has taught writing at Harvard University since 2003.Greg has been recipient of a Fulbright Fellowship and grants from the National Endowment for the Humanities and Oregon’s Regional Arts and Culture Council. His audiorecording “Champion of Hot Peppers”won a 2001National Parenting Publications Association Gold Medal for storytelling.His translation of Seno Gumira Ajidarma’s novel Jazz, Perfume, and the Incident was published as part of the Modern Library of Indonesia (2012).